I want to encourage you to attend the upcoming Environmental Protection Agency (EPA) community engagement event on polyfluoroalkyl substances (PFAS) on July 25 at Hatboro-Horsham High School, 899 Horsham Road in Horsham. If you cannot attend, you’ll be able to watch the whole event live on my website. It will then be posted to YouTube for future reference. The event will include a working session from 10 a.m. to 3 p.m., followed by a listening session from 4-9 p.m. This is one of three similar events the EPA will hold throughout the summer, with meetings also in Colorado and North Carolina. It’s a chance to ask your questions and share your concerns about the drinking water contamination the federal government caused in our community. If you are interested in speaking, select the option to speak while registering. The event is open to the public. Keep in mind, the online registration will close on Friday, July 20, at 10 a.m. Those unable to register online will be able to register or sign up to speak in person at the event. Registration is not required to attend or speak. Call my office at 215-368-5165 with any questions. 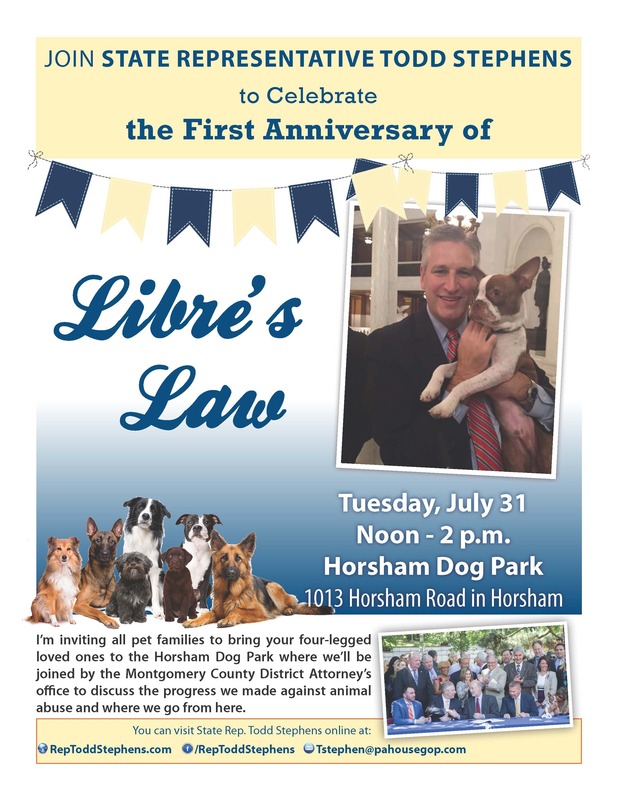 I’d like to invite you to join me in celebrating the first anniversary of Libre’s Law. Last year the Legislature passed and the governor signed into law my animal abuse reform package, now Act 10 of 2017. National animal organizations touted my law as the most significant reform in the country. Learn more on July 31, noon to 2 p.m., at the Horsham Dog Park, 1013 Horsham Road, where pet families will bring their four-legged loved ones to the park where we’ll be joined by the Montgomery County District Attorney’s office to discuss the progress we made against animal abuse and where we go from here. I want to remind all senior SEPTA riders that the agency will phase out the PA Senior Citizen Transit ID Card at the end of the service day on Friday, Aug. 31 and replace it with the new SEPTA Key Senior Photo ID Card which seniors can obtain at my district office. According to the agency, most seniors who ride SEPTA have already switched to the SEPTA Key Senior Photo Identification cards. Starting Sept. 1, seniors will need the SEPTA Key Senior Photo ID Card to receive free rides on transit and discounted Regional Rail fares ($1 for travel in Pennsylvania). Valid Pennsylvania driver's licenses and non-driver IDs with a magnetic stripe on the back can still be swiped at turnstiles and fare boxes; new licenses issued by PennDOT on or after July 2017 do not have magnetic strips and cannot be used. As a courtesy to SEPTA, my office at 515 Stump Road, can help you apply for this new senior SEPTA Key Card. Because the cards take some time on SEPTA’s end to process, I encourage seniors to stop in my office as soon as possible to ensure minimal interruption of their transportation needs. Call my office at 215-368-5165. Seniors who sign up by Aug. 1 will have their SEPTA Key Senior Photo ID card mailed to them no later than Sept. 1. • Birth certificate or baptismal certificate. • Yellow PACE Card (Pharmaceutical Assistance Contract for the Elderly). • Statement of Age Verification from the U.S. Social Security Administration. • Armed forces discharge/separation papers. • Resident alien card or passport/naturalization papers. For more information or questions about the SEPTA Key Senior Photo ID, visit here, or call SEPTA Customer Service at 215-580-7800. To help ensure a more efficient delivery of human services programs in Pennsylvania, the Human Services Code portion of the 2018-19 state budget package contained reforms and updates that seek to save taxpayers money while still taking care of our most vulnerable citizens. Act 40 of 2018 makes several changes to the state’s Medicaid program to ensure maximum efficiency, including new ways for counties to provide nonemergency medical transportation services to eligible and enrolled Medical Assistance recipients. Another change establishes two Medicaid outcome-based programs to increase efficiency in hospital services and managed care programs. Finally, the new law aims to reduce long-term care expenses by providing information about the Living Independence for the Elderly program to individuals seeking long-term care services and supports. Studies show that seniors recover faster and have a better quality of life in their own residences. Legislation that will give parents the final word on treatment in substance abuse cases involving their children has been signed into law in Harrisburg. Act 47 of 2018 allows a parent or legal guardian to provide consent over the objection of a minor with respect to furnishing medical care or counseling related to diagnosis or treatment of substance abuse. It also seeks to protect the patient’s rights in that anyone providing medical care may only share information with the parents that would reduce the threat of harm to the minor. The new law takes effect in late August. To help ensure that babies in Pennsylvania who are born dependent on controlled substances are safely cared for and receive critical medical and developmental services, a new law closes a loophole in the reporting of such cases to proper authorities. The legislation is designed to ensure that mothers and their babies affected by drug use get the help they need. Act 54 of 2018 requires that child protective services develop a plan of care for the infant and puts the state in compliance with a 2003 federal law. It also clarifies how authorities should respond, focusing on providing help to the babies’ families rather than automatically treating the mothers’ drug use as a criminal act. According to state data, more than 920 babies were born with neonatal abstinence syndrome in Pennsylvania in the first six months of 2018. This year’s 2018-19 state budget addresses many of the state’s critical health needs by directing resources to several important line items, including Lyme disease. With Pennsylvania leading the nation in the number of Lyme disease cases, $2.5 million in state funding will help combat and treat those affected by the disease. Efforts will include building a more robust Lyme disease prevention and education program, conducting more well-rounded surveillance through activities like a statewide environmental survey, and improving participation in tick-borne disease surveillance with providers and local health departments. The funding specifically addresses many of the recommendations outlined by the Lyme Disease Task Force created by the General Assembly in 2014. Other health-related funding priorities in this year’s budget include: increases to support the state’s West Nile Virus and Zika Virus control program; enhanced efforts to take care of those with intellectual disabilities; and new home visiting services that will be offered to families affected by the opioid epidemic. Bio-technology research, ALS support services and regional cancer centers also received increases in this budget.